Clear off the snow and ice before driving. If snow has fallen since your car was parked, take the time to thoroughly brush it off the vehicle–including the roof–and scrape any ice from the windows. “Peephole driving” through a small, cleared spot on your windshield reduces your visibility and is quite dangerous. Accelerate slowly to reduce wheel spin. 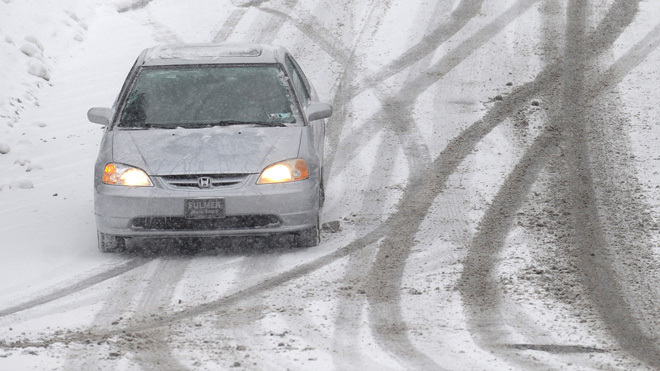 If starting from a standstill on slick snow or ice, start in second gear if you have a manual transmission or gear-selectable automatic so the vehicle is less likely to spin the tires. Reduce your speed and drive smoothly. In slippery conditions, tires lose their grip more easily, affecting all aspects of your driving: braking, turning, and accelerating. Keeping the speeds down will give you more time to react to slippage or a possible collision, and it will lessen the damage should things go wrong. Allow longer braking distances. Plan on starting your braking sooner than you normally would in dry conditions to give yourself extra room, and use more gentle pressure on the brake pedal. Don’t lock your wheels when braking. Locked wheels can make the vehicle slide or skid. If you have an older vehicle without an antilock braking system (ABS), you may need to gently apply the brakes repeatedly in a pulsing motion to avoid having them lock up the wheels. If your vehicle has ABS, simply depress the brake pedal firmly and hold it down. The shuddering sounds and pedal feeling is expected (don’t lift off the brake); the system is doing its job. Perform one action at a time when accelerating, braking, and turning. Asking a vehicle to do two things at once–such as braking and turning, or accelerating and turning–can reduce your control. When taking a turn on a slippery surface, for instance, slowly apply the brakes while the vehicle is going straight. Avoid sudden actions when cornering. A sudden maneuver–such as hard braking, a quick turn of the steering wheel, sudden acceleration, or shifting a manual transmission –can upset a vehicle’s dynamics when it’s taking a turn. Rapidly transferring the weight from one end or corner to another can throw a car off balance. In slick conditions, this can cause it to more easily go out of control. Be ready to correct for a slide. Should the rear end of the vehicle begin to slide during a turn, gently let off on the accelerator and turn the steering wheel in the direction of the slide. This will help straighten it out. Electronic stability control will also help keep control in a slide situation. But remember, safety systems may bend the laws of physics, but they can’t overcome stupid. Don’t let four- or all-wheel drive give you a false sense of security.4WD and AWD systems only provide extra traction when accelerating. They provide no advantage when braking or cornering. Be extra wary of other motorists. They may not be driving as cautiously as you, so leave extra space, avoid distractions, and be predictable, signaling clearly ahead of any turns or lane changes.